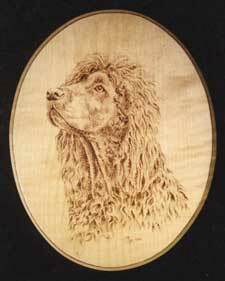 The selection of designs shown in this gallery are examples of specially commissioned pet portraits on sycamore. Available either as a framed circular miniature or on oval and rectangular shaped pieces in two sizes which can be presented with or without a brown hessian backed frame. All come complete with brassed hangers. 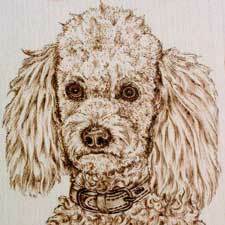 Full details on having an individual piece especially created for you can be found on the Commission page. A framed miniature pet commission is shown on the left. 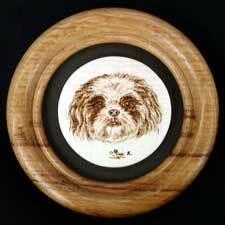 The 2" dia sycamore round is set on a complementary mount in a circular solid wood frame (approx 3.5" dia x 0.5" deep). On the right is a close up of a pet portrait which was carried out on a solid sycamore 7" x 5" shaped rectangular piece (larger 10" x 7" size also available). 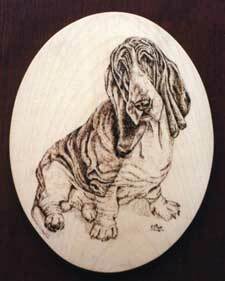 The pet portraits shown above have both been carried out on solid sycamore 7" x 10" ovals (smaller 8" x 6.5" size also available).